Wrap Bundles using 3M LX480mC & LX480mC with 8548 gloss, 8549 lustre adn 8550 matte overlaminate. MD-X Media Bundle is a 7-year, 2mil (50 micron) ultra-conformable, extensible vinyl print film matched with a 2mil pressure sensitive overlaminate. MD-X print film is supplied with the MetaScape air release adhesive system to allow quick and easy application on compound curves and moderate recesses. 40C-10R or 40C-20R with Controltac and Comply, bundled with 8508 or 8509 for use on flat to simply curved surfaces. Vehicle Wrap Bundles using 3M 48C-20R eco-friendlier, non-pvc film and Envision 8048G gloss overlaminate. 3M 40C-114R is a 3mil, removable, intermediate clear vinyl film with Controltac advanced repositionability and Comply adhesive for easier, bubble-free application. A durable, removable 2 mil film along with 3M Scotchcal matte overlaminate 3647 to make a slip-resistant graphic for application to unsealed outdoor pedestrian surfaces. 3M Envision 48C is a 4.3mil, matte removable, intermediate 5-year, non-PVC polymer print film with Controltac and Comply grey adhesive on a polyethylene-coated paper liner. A 3.2 mil calendered polymeric lustre white opaque film with permanent clear adhesive. A combination of high performance and economical price in a 2-year outdoor film. A 4 mil, opaque vinyl for all ink sets that is durable, yet long-term removable for interior and exterior graphics. Good for colder weather installations with air and substrate ranging from from -2 degrees C.
IJ39-20 is a 3.5 mil, matte finished, vinyl on a double-sided polycarbonate paper liner with a clear high tack, permanent pressure-sensitive adhesive, for low surface energy and hard-to-stick-to surfaces. 3M IJ39-20 comes with an expected performance life of 5 years. IJ3555-10 is a gloss, 4 mil calendered, white, opaque vinyl film is used for short term bus, fleet, interior and exterior graphic signs, vending or dispensing machines and cooler graphics that need to be positionable and removable. A 3.5 mil polymeric calendered white vinyl with a matte finish and a clear, removable adhesive which offers excellent UV resistance, and long term adhesion. A a 4-mil, opaque matte film with a positionable, pressure-activated grey adhesive that is removable with heat, making it ideal for medium-term graphics for floors, fleet or commercial vehicles, and indoor or outdoor graphics. For indoor floor graphics combine with 3M 3645 testured laminate. A 4 mil calendered opaque controltac film with a medium strength grey removable adhesive. Ideal for medium-term graphics for fleet or commercial vehicles and interior or exterior graphic applications. IJ35-10 is a 3.2mil gloss calendared film with a permanent grey adhesive on an unmarked paper liner. This film offers excellent imageability. IJ35-20 is a 3.2mil matte calendared film with a permanent grey adhesive on an unmarked paper liner. This film offers excellent imageability. IJ35C-20 is a 3.2mil gloss calendared vinyl film with a permanent, grey pressure-sensitive adhesive with Comply air egress for fast, easy bubble-free installations. Designed for solvent, latex and UV cure printing. This product is ideal for short to medium-term, indoor and outdoor promotional graphics, signs, trade show and point-of-purchase displays. IJ35C-20 is a 3.2mil matte calendared vinyl film with a permanent, grey pressure-sensitive adhesive with Comply air egress for fast, easy bubble-free installations. A 3 mil matte vinyl film with a changeable, pressure-sensitive adhesive. Ideal for short-term king and queen board promotional graphics on transit vehicles or box trucks. 3mil gloss and matte polymeric calendered film, with a Controltac grey pigmented, pressure-activated adhesive for easy sliding, tacking, snap up and repositioning. Includes Comply Adhesive for fast, easy bubble-free installations. A 4 mil matte vinyl film with a changeable, pressure-sensitive adhesive. It is designed for solvent and UV-based piezo inkjet printing. ASLAN Print'nGo DFP 33 is an 8mil self-adhesive, textured white digital printing film that is the ideal product for short-term indoor floor graphic applications. The 8mil (125 micron) thick film is designed for for smooth interior floors. ASLAN WindowBlock DFP 25 is a 7mil (180 micron) self-adhesive, digital printing film with high opacity that has a blockout core but is white on both sides and has a removable adhesive. Compatible with Solvent, eco-solvent, latex, UV-curable inks and screen printing. ASLAN PrintMilky Dryapply DFL 210 is a 3.15mil (80 micron) printable, PVC self-adhesive glass decoration film with milk-glass effect that is ideal for creative effects on all glass surfaces. Illustra Snow IL 351 or Linen IL 350 are 3.15mil, air egress DRY APPLY polymeric glass decoration films with an appealing snow design or linen weave design for easy dry application. Printable with solvent, eco-solvent, latex and UV inks. 3.4 mil flexible, calendered vinyl film that offers outstanding durability and outdoor performance in demanding applications. Avery HP MPI 2050 is a printable, premium calendered, matte translucent film with a permanent adhesive. Compatible with solvent, eco-solvent, latex and UV-cure inks. A 3.4 mil economy calendered white vinyl with a matte finish and a clear, removable adhesive. A 6 mil calendered vinyl with a clear removable acrylic adhesive. A 3.4 mil economy calendered white vinyl with a gloss finish and a clear, permanent adhesive. A 3.2 mil white opaque glossy calendered vinyl film. Perfect for POP, product Identification labels, medium term OEM decals, as well as outdoor and general signage. Avery Dennison MPI 2920 is a 3.4mil, satin white polymeric calendered vinyl film designed for use in a wide range of intermediate outdoor applications and general signage applications, where good outdoor durability and good print quality are required. A 3.4 mil economy calendered white vinyl with a matte finish and a grey, removable adhesive. A 3.4 mil economy grade calendered white vinyl with a matte finish and a grey, permanent adhesive. MPI 3300 Gloss and 3320 Matte are 3mil flexible, calendered vinyl films with a clear permanent adhesive that deliver vibrant and consistent print images at an exceptional value. MPI 3303 3 mil Gloss Series features a gloss permanent (grey) adhesive on a flexible, calendered vinyl films that deliver vibrant and consistent print images at an exceptional value. MPI 3302 3 mil Gloss Series features a removable (grey) adhesive on a flexible, calendered vinyl film that deliver vibrant and consistent print images at an exceptional value. 3.1mil EZ or EZ RS calendared, high gloss white films with long term removable adhesive. Applicable for use on flat or simple curved surfaces. Printable with solvent, eco-solvent, latex and UV-cure inks. Avery MPI 2610, 2611 smooth and 2630 and 2631 textured wall films are thick, tough, scuff-resistant, flexible, white premium calendered vinyl films for wall graphic applications. 3 textured options with 100% opacity completely covers whatever is underneath; Canvas 6 mil, Crushed Stone 8 mil or Stucco 6 mil to complement the existing 2610 permanent and 2611 removable smooth matte films. 4 mil matte flexible vinyl with permanent acrylic adhesive on a 90lb liner. Ideal for bumper stickers, POP decals, fleet markings and decals. 4 mil matte flexible vinyl with removable acrylic adhesive on a 90lb liner. Ideal for bumper stickers, POP decals, fleet markings and decals. A white, flexible, 4 mil vinyl with a low-tack, acrylic, removable pressure sensitive adhesive, formulated for use in a wide range of thermal inkjet printing system. Catalina 6mil Wall Graphics for HP Indigo offers an ultra removable and reusable adhesive for use in decal applications requiring easy removal from walls with smooth surfaces. 6 mil matte white, soft, flexible vinyl with a clear permanent acrylic adhesive. Convex High-Bond has 2 mils of adhesive as opposed to 1 mil for better bonding to rough textured surfaces. Polar Polymeric is a white, 3.2mil, printable premium, polymeric self-adhesive vinyl with a high quality, indoor/outdoor removable clear acrylic adhesive. Polar Polymeric is a 3.2mil, printable premium, polymeric self-adhesive vinyl with a high quality, indoor/outdoor permanent gray acrylic adhesive. It has a high opacity, strong white point and offers excellent indoor and outdoor durability for 5-7 years. Polar Polymeric is a 3.2mil, printable premium, polymeric self-adhesive vinyl with a high quality, indoor/outdoor removable gray acrylic adhesive. This product is cold weather approved and can be installed down to -20C. It has a high opacity, strong white point and offers excellent indoor and outdoor durability for 5-7 years. Polar Grip is a 3.2 mil, matte polymeric face film with a very aggressive, grey, aqueous permanent acrylic adhesive on a 90# kraft release liner. Ideal for use on low surface energy plastics. Compatible with solvent, eco-solvent, latex and UV cure inks. Polar Smooth 150 is a 6 mil (150 micron) matte polymeric, white PVC film with a clear, removable adhesive on a 78# white Kraft liner. Minimum application temperature -20C. SpotOn is a 4mil, matte clear, gloss clear or matte white monomeric PVC film with a pressure sensitive dot patterned polyacrylate adhesive. Ideal for indoor or short-term outdoor end-user installs. A 3.2mil, 2-year outdoor, white monomeric PVC film with a permanent or removable pressure sensitive grey adhesive. Available in matte or gloss, permanent or removable. Polar Poly Transit is a 3.2 mil polymeric premium, matte white self-adhesive PVC film with a high quality, removable gray acrylic adhesive. MDP-H has a grey, blockout high tack adhesive for low energy surfaces, such as polypropylene, polyethylene and ABS plastics. It is also useable for durable graphics and decals on extreme sports equipment. Metamark's MD3-B 2.76mil, gloss white face film with its distinctive coating technology produces outstanding print performance. Available with or without air egress. MD5 White and Clear are both 2.76mil calendared, polymeric, high gloss self-adhesive digital vinyl. For solvent, eco-solvent, UV and latex printers. Metamark Frost WET APPLY printable window film offers a monomeric, calendared, semi-transparent film with an opal sheen that allows 85% light transmission. Metamark Silver Etch Wet Apply is a 2.76mil polymeric calendared etch film with silver sparkles. This self-adhesive etched glass window film is digitally printable, and provides a striking effect when producing decals, printed graphics or architectural effects. MetaScape Silver Etch air egress, DRY APPLY, printable window film offers a polymeric calendared, semi-translucent film with a silver sheen that allows 56% light transmission. Compatible with eco-solvent, solvent, latex and UV-cure inks. MetaScape Frost air egress, DRY APPLY, printable window film offers a monomeric, calendared, semi-transparent film with an opal sheen that allows 85% light transmission. Compatible with eco-solvent, solvent, latex and UV-cure printers. High performance digital vinyl with grey 'MetaScape' Adhesive, offering faster and easier application by providing air with an exist route from under the graphic, with greater repositioning during application. VinylEFX are printable, metallized films with a permanent adhesive that are suited for general purpose, flat signage applications and resists most marring and staining. Available in Decorative Indoor or Outdoor Durable. Compatible with solvent, eco-solvent and UV-cure inks only. A 3 mil calendered film available in gloss and matte with a grey, permanent or removable adhesive. 6.6mil, white reflective, printable, conformable wrap film with 3M Micro-Comply adhesive technology. IJ5100-R is a 7mil flexible, white calendered reflective film with medium strength white removable pressure-sensitive adhesive. Designed for superior cutting and weeding, and removes with heat. IJ680CR-10 is a 6 mil calendered reflective film, high strength clear removable adhesive with Comply Performance technology. Use it for commercial vehicle, rail and bus graphics, sign graphics and striping. VisiFlex V-8000 High Visibility Reflective Film is a 21-26mil thick, omni-directional engineered film to improve the day and nighttime visibility of emergency response, utility, and construction fleets. White film is compatible with solvent, eco-solvent, latex and UV-cure, all colours are compatible with screen inks. Avery 9500 Series, Omni-View is the perfect 17 mil choice for premium prismatic sheeting applications that require high reflectivity at both long and short distances. Polar Burst is a 3.7mil, printable, ultra-reflective grey-silver satin, self-adhesive PVC film with a removable grey acrylic adhesive on a PET liner. Polar Burst adheres well to smooth, flat surfaces. A fully printable commercial grade reflective, suitable for advertising, vehicles, retail and display, offering high impact signage. Window Film 8170-P40 offers a 60/40 perforation pattern that boosts the intensity of the printed image with slightly reduced viewing through the second surface (non-image side). Ideal for high-profile messaging in storefront windows. Window Film 8170-P50 offers a 50/50 perforation pattern. It offers balanced viewing from both sides of the film. 3M Scotchcal Clear View Graphic Film IJ8150 is a cast vinyl film with optical clarity that allows new approaches to graphics for windows. Unprinted areas permit a completely clear view through glass. Removable with heat. IJ61 is a clear, durable 3-mil vinyl with a changeable dry apply adhsieve for clean removability. 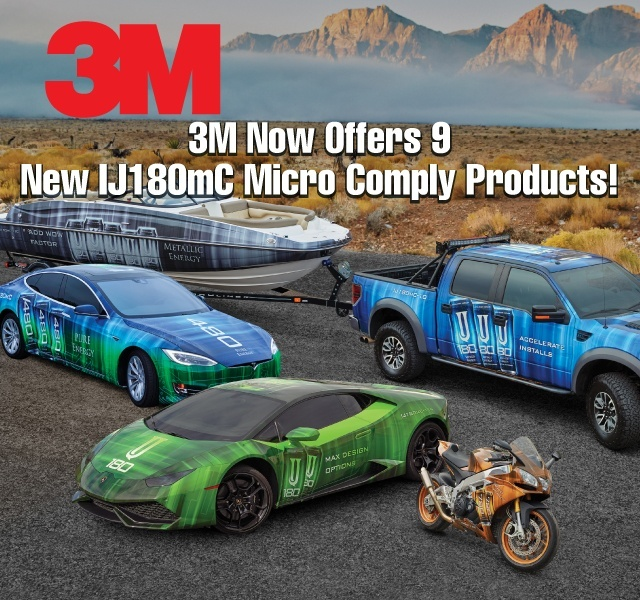 3M IJ67 is a 60/40, 5.9 mil vinyl film that comes with removable adhesive and a polycoated paper liner that is backed with a continuous paper layer. Compatible with solvent, eco-solvent, latex, screen and UV-cure ink. A 3.2 mil matte vinyl film has a changeable, dry-apply pressure-sensitive adhesive. Use it where a good quality film is needed for short-to medium-term, indoor and outdoor promotional graphics. MPI 2077 is a 3.4 mil, ultra-clear film with a removable adheisve on a clear PET liner. This product allows you to turn glass panels or windows into engaging selling tools. A 7 mil perforated flexible calendered film for use on one way visual panels. A 65/35-perforation pattern, which provides an open area of 35%, increasing the print surface area for enhanced image resolution while retaining its one-way visibility. This film is ideal for architectural, retail signage, POP, tradeshow graphics, and general signage. Avery Dennison SF 100 Ultra clear is a 2mil ultra transparent, high gloss film featuring a printable polyester face with a clear removable, acrylic based adheisve on a dimensionally stable 178gsm filmic liner. A flexible 4 mil premium clear vinyl film, coated with an acrylic removable low-tac pressure sensitive adhesive and a 90# stay flat release liner. A white, flexible, 4 mil vinyl with a low-tack, acrylic, removable pressure sensitive adhesive. Formulated for use in a wide range of inkjet printing system. An 8 mil, very soft, optically clear static cling vinyl in clear or white which adheres to most clean, high polished smooth surfaces without adhesive. Also available in optically clear. A 60/40 perforated, high quality polymeric vinyl with a clear, acrylic pressure-sensitive adhesive that minimizes shrinkage. It provides low temperature application, reliable adhesion and the best and cleanest removability of any product in its class. A 70/30, perforated, high quality polymeric vinyl with a clear, acrylic pressure-sensitive adhesive that minimizes shrinkage. It provides low temperature application, reliable adhesion the best, cleanest removability of any product in its class. Performance 80/20 is a white on black perforated self adhesive window vinyl with 20% transparency and a removable, pressure-sensitive adhesive with grayliner technology. Performance 70/30 is a clear, view-through premium quality perforated window films for inside or outside apply window applications for solvent, latex and UV printers. Translucent 70/30 is a tranclucent perforated window film for 24/7 viewable, backlit window applications. Contra Vision HD (High Definition) Performance is a white on black 60/40 perforated window film for one-way vision graphics on a universal liner that is compatible with all ink sets. It gives the printed look of a 70/30 with the rear view-thru of a 50/50. Contra Vision® Campaign Clear is a Clear perforated self-adhesive vinyl with 30% transparency and a clear removable, pressure-sensitive adhesive, featuring a clear Universal Liner, for the production of all inside application see-through graphics. ViziPrint Impress Clear is a 4mil, gloss, optically clear PET film with proprietary adhesion technology that is protected by a clear, 1 side siliconized release liner. Its proprietary adhesion technology creates a strong bond in both high and low temperatures (-5C) without leaving residue behind. Great for long-term indoor and short-term outdoor use. An 8mil (203micron) PVC clear or white line of static cling materials on a robust 11mil PE-coated paper liner. A 1mil optically clear. permanent/permanent, pressure-sensitive mounting adhesive for clear substrates. WindowTac is a visually clear, 1mil, PET film, with a permanent adhesive on one side and an air egress removable adhesive on the other. 2mil optically clear PET, ViziPrint Deco SR is designed to adhere permanently to virtually any smooth surface, including glass, plastic and metal. ViziPrint Impress SEL is an optically clear, or an ultra-white printable polyester film with proprietary suction technology that is easy to install and reposition over and over again. Compatible with solvent, eco-solvent, latex & UV-cure inks. Minumum install temp -5C. Drytac ViziPrint Illuminate is a new 5.5mil PET, Latex and UV-cure printable, frosted polyester backlit film that incorporates the same ViziPrint silicone suction cup adhesive that is on all ViziPrint products. Strong removable type adhesive, and highly transparent film. Suitable for window decoration and indoor application only. PolyBrite Poly Perf is an inside-mount, white on black, non-adhesive, 8mil polyester film with a 70/30 perforation. It comes with a polyliner that is removed after printing. Double sided optically clear tape for the application of WindowBrite InMount. Ideal for retail POP applications. A 70/30 perforated window film without adhesive, designed for inside application or second surface applications. Graphics can now be applied to the interiors of windows, while still maintaining image impact and integrity. SV480mC and LX480mC are high performance, 2-mil white, non-PVC films with a lustre finish and pressure-activated adhesive for easy sliding, tacking, snap up and repositioning. Both products offer a non-visible air release channels for fast and easy, bubble-free installations. Dichroic architectural iridescent films can be used in applications such as shading fins, balustrades, exterior glass, glass partition walls, shower door glass, artistic glass and glass furniture. MPI 3901 is a 2.6mil (65 micron) PVC Free, semi-gloss, polyolefin face film with a clear, removable adhesive on a clay-coated paper liner. Compatible with Latex & UV cure inks only. 1year outdoor durability. Removable, matte, self-adhesive printable PVC film for floor graphics. A 23mil total thickness, two-part, reverse-printed PVC based material set with a rubberized backer for the creation of counter mats, mousepads, coasters and more. 5 mil durable PVC film with black chalkboard finish. SpotOn Floor 200 is an 8mil print and go material for short-term, indoor floor graphics without the need for lamination. Simple, easy installation. R10 slip rated and B1 fire rated, it can also be cleanly and quickly removed within six months of application. GloBrite #7615 is a 9mil, PVC based photoluminescent printable film with a removable adhesive. With the release liner this material is 15mil thick. This material will glow for up to 2 hours and recharges again within 10-15 minutes. Compatible with solvent, latex and UV inks. Jessup Matador is a 2-part, thick, PVC based mat system ideal for both counter top and floor mats. The system is made up of a 20mil reverse-printed, clear PVC base (available in either fine or coarse texture), which is then laminated to a 40mil thick textured, slip resistant backer. Ashphalt Art is a patented, 23mil thick, aluminum foil based material with a double-thick adhesive layer for short to long-term application onto asphalt, concrete, stairs, stone, brick and other walking and driving surfaces. Comaptible with UV-cure and latex ink. Slip-resistant, textured surface, with waterproof adhesive, designed for short-term outdoor advertising and events. ClearWalk is an 18mil thick, textured translucent floor graphic material that blends with the surrounding surface creating unique and dynamic visual effects. No lamination required - print and go! TexWalk is an 8mil white, textured, matte vinyl with fabric backing and repositionable, solvent acrylic adhesive. It works great on carpet, tile, wood, metal & painted surfaces and is ideal for tradeshow and POP graphics. No lamination is required - just print and go! A light weight 12oz, double side printable, fire retardant (NFPA 701), super smooth blockout with a 200 x 1200 denier reinforced polyester scrim. Compatible with solvent, eco-solvent, latex, UV and screen inks. 8oz, 1000 denier strength banner mesh with liner, offering 35% air flow. Fire retardant for interior POP or tradeshow use. Ideal for any indoor or outdoor application where air flow-through or visibility show-through is desired. Our 13oz 1000D frontlit banner is single side printable and is manufactured with a 9x9 polyester weave support structure laminated on both sides with a bright white PVC surface. Compatible with solvent, eco-solvent, latex and UV-cure printers. 13oz, PET, single side printable, grey back, anti-curl banner is a banner material manufactured with a blockout polyester film centre and PVC layer fused to the top. It is the perfect lay-flat choice for all indoor retractable banner or hanging display graphics applications. 15oz, PET, double side printable, anti-curl banner is manufactured with a blockout polyester film centre and PVC fused to the top and bottom. It is the perfect choice for all hanging indoor double sided printed banners or display graphics applications. 13oz, double side printable, Fire Retardant, super smooth blockout with a 250 denier reinforced polyester scrim. For retractable stands and POP. 18oz, double sided, Fire Retardant, scrim banner material with a 1000 denier extremely strong blockout polyester scrim. Compatible with solvent, eco-solvent, latex and UV-cure inks. Ferrari Decolit Master 251 is a lay-flat, 9.5 oz single sided, matte, fire-rated, ultra stay flat banner. Ideal for hanging banners, P.O.P. displays, exhibition graphics and roll-up displays. Ferrari Master Black is a lay-flat, 9.5 oz single sided, matte, fire-rated, ultra stay flat block-out banner. Ideal for hanging banners, P.O.P. displays, exhibition graphics and roll-up displays. 14.7 oz, one side matte, one side gloss, fire-rated, ultra stay flat banner. Ideal for hanging banners, special event promotions, wall decoration, billboards and stadium banners. EarthSmart Eclipse is an 8mil white, polypropylene blockout banner with a satin finish, that can be double side printed with UV-cure inks. Printable Eclipse Solvent 10mil is a fast-drying, no-curl, layflat PET film media compatible with solvent, UV and latex printers. 100% opaque, durable 7.5mil polyester film for aqueous inks, recommended for use in retractable banner stands. Silkscape polypropylene is an 8mil, cost-effective, curl-resistant, opaque for retractable and X-frame banner stands. It is compatible with solvent, eco-solvent, latex and UV printers. Reveal backlit is a high quality, semi-rigid 7mil, polyester backlit film with a satin-matte finish. It effectively transmits light when placed into backlit boxes or illuminated displays. Compatible with Latex and UV-cure inks. An 18 mil thick, fast-drying, no-curl media semi-rigid media compatible with latex, UV, eco-solvent, and solvent printers. The anti-reflective, white, matte surface offers superior ink adhesion as well as scratch and water-resistance. Reveal Backlit is a high quality, 8.5mil polyester translucent backlit film with a matte or gloss finish. It effectively transmits light, dispersing it evenly and consistently across an image. Compatible with eco-solvent, solvent, latex and UV inks. Printable Eclipse Solvent is a 7.5 mil (190 micron) fast-drying PET film available in either matte or gloss finishes with a bright white surface that has vibrant image quality. Compatible with Solvent, Eco-Solvent, Latex and UV inks. Gerber ImagePerfect 2405 is a 6.5mil, water resistant and extremely scratchproof paper, even when wet. It is intended for indoor and short-term outdoor use. Compatible with solvent, eco-solvent, latex & UV-cure inks. Endura Satin 7mil is bright white cellulose based, latex saturated paper. The perfect choice when a more economical product is needed for photos, prints, plans and posters. Endura Satin or Matte 10mil are bright white cellulose based, latex saturated papers ideal for photo, poster and general POP use. It is wet-strength for durable indoor and temporary outdoor use. Instant dry, strength, durability, and the ability to fold without the image cracking are key benefits of this economical paper. Compatible with eco-solvent, solvent, latex and UV-cure ink. Endura TR Satin 10mil is a satin finished, bright white cellulose based, latex saturated paper. It is manufactured with the addition of longer cellulose and synthetic fibres to provide high tear strength and flexibility. Compatible with solvent, eco-solvent, latec and UV-cure ink. Flexart Canvas 15mil is a gloss canvas textured paper manufactured with long synthetic fibers for durability. Flexart has a consistent canvas texture to mimic traditional canvas, however offers an environmentally conscious alternative. Endura Satin 17mil is a satin finished, bright white cellulose based, latex saturated card-stock on a roll. It is suitable for durable indoor and temporary outdoor use. It is the perfect choice when a thick lay flat card-stock product is needed. Compatible with solvent, eco-solvent, latex and UV-cure ink. GreenLight II Plus is an 8mil (175gsm) bright white coated two side backlit poster paper that provides uniform translucency and image definition in both frontlit or backlit poster applications. Blox-Lite is a paper-based, 8.5mil thick, 100% opaque, grommetable banner and sign material. Blox-Lite is printable on two sides. DigiScape Stick-R is an FR rated, PVC free, latex-saturated, non-woven self adhesive wallcovering. It has a slightly textured matte finish and a removable adheisve for easy peel and stick applications. DigiScape Smooth is a matte finished, 17 mil digital print commercial wall covering media that is applied using standard wallpaper paste. It is manufactured using 30% post consumer waste content, and latex saturated cellulose fibres. A durable option for short and long-term wall covering materials. Compatible with solvent, eco-solvent, latex & UV ink. DigiScape Canvas is a matte finished, 17 mil thick digital print commercial wall covering media that is applied using standard wallpaper paste. Manufactured using 30% post consumer waste content, and latex saturated cellulose fibers. Compatible with solvent, eco-solvent, latex and UV-cure inks. EnviroScape Mural is a 10mil, textured, PVC free wall, window or hard surface scaping product that is pre-pasted with a water activated adhesive backing system, making it easy to install and just as easy to remove. Endura Matte 10mil is a bright white cellulose based, latex saturated photo and poster paper. It is saturated for durable indoor and temporary outdoor use. Instant dry, strength, durability and the ability to fold without the image cracking are key benefits of this paper. Compatible with sovlent, eco-solvent, latex and UV-cure ink. Endura Stick-P 7mil is a bright white cellulose based, latex saturated paper with a permanent pressure sensitive adhesive on a paper liner. Endura Stick-P is an PVC-free alternative to pressure sensitive vinyl. Compatible with solvent, eco-solvent, latex & UV-cure inks. 20lb plain bond paper is bright white and uncoated. It is applicable for use on toner, inkjet and traditional wide format plotters. As the material is uncoated care is to be taken on the amount of liquid ink put onto the surface as to not incur bleed. This product comes on a 3" core. 5.5mil glass-clear PET film with a high gloss surface and an anti-static backing. An 10 mil gloss, block-Out polypropylene grey back paper, with a bright white vinyl face. Excellent for posters, POP and tradeshow displays that do not require adhesive. Tear and water resistant. An 8 mil, matte, ultra smooth double-sided, matte polyester film. Excellent light-stopping performance and flexibility, no show-through. An ideal choice for double sided POP displays, banner stands and posters and push/pull decals. Compatible with solvent, Latex and UV inks. An 8 mil polypropylene gloss paper. Excellent for posters, POP and tradeshow displays that do not require adhesive. Tear and water resistant. PolyBrite Pop-Up is a 15mil thick white, polyester block-out film that is perfect for pop up displays. It requires no lamination. Compatible with solvent, eco-solvent, latex and UV-cure inks. Polybrite Roll Up is a polyester based, 7 mil white front, grey backed block-out film that has a textured print surface. No lamination required. SolvoPrint Nolite 165 is a 6.5 mil polyester film for use with solvent, eco-solvent, latex and UV curable inks. This product contains an integrated light-blocking layer for 100% opacity - making it suitable for indoor use and short-term outdoor use with a wide variety of banner and display applications. SolvoPrint Nolite 360 is a 14 mil polyester film for use with solvent, eco-solvent and UV curable inks. This 14 mil product contains an integrated light-blocking layer for 100% opacity - making it suitable for indoor use and short-term outdoor use with a wide variety of banner and display applications. 8mil, polyester (PET) semi-rigid film for all backlit applications. This product offers a satin print surface resulting in deep saturated color for images and graphics while holding fine details and type. Gerber ImagePerfect 2320 is a 20.5mil, poly-cotton woven canvas textile which allows for the creation of printed output with the real look of artistic paintings. Compatible with solvent, eco-solvent, latex & UV-cure inks. Bead Keder is a silcone or PVC strip that is sewn onto the edge of tension fabrics and then inserted into aluminim extrusion frames. Monet Canvas is a heavyweight 10 oz/yd coated canvas with a prominent tooth that is ideal for giclee art reproductions, as well as for eye-catching POP signage, museum displays, interior decorating and store signage. this strong, yet flexible, canvas features a uniform matte texture and its specialized coating allows for vibrant, photorealistic printing with a wide color gamut. Pure Colour VersaFabric is a 100% polyester fabric with a specialty coating for both indoor and outdoor applications where colour, wrinkle resistance and drape are important. VariTex Deco Frame 250 CA is a 100% polyester knitted fabric with moderate stretch and good wrinkle resistance, For indoor use. Compatible with latex, UV-curable, aqueous pigment and dye sublimation water-based inks. A woven 13oz, square weave archival print canvas that is 100% Polyester with an acrylic coating. Ideal for fine art reproductions, wall murals and retail signage. Compatible with solvent, latex and UV-cure inks. 6oz, 100% polyester, tightly knit textile with two sided print capability for frontlit and backlit use. 4oz PVC Free, pressure sensitive adhesive fabric wall covering with a 150 denier, 100% polyester woven fabric base and inkjet receptive layer. The adhesive is a repositionable, removable, acrylic adhesive on a 90 pound kraft release liner. For wall murals or it can be contour cut for wall decal and window graphics. Applicable for solvent, eco-sol, latex and UV-cure print. 11oz Roll-Up, is a lay flat, no curl fabric with a 600 denier. It is constructed of 100% polyester and the woven fabric is manufactured with a superior inkjet receptive layer and a bright white point. Compatible with solvent, eco-solvent, latex and UV-cure inks. 3oz Flag Polyester with liner that is is suitable for a wide variety of banners and flags for indoor or short-term outdoor use. Compatible with Solvent, Eco-Solvent. Latex (Gen3 Inks) or UV ink. 7.3oz heavy knitted 100% polyester textile designed to provide outstanding colour consistency and excellent image sharpness when printed. Compatible with UV, Latex, Dye-Sub Transfer and Disperse Dye-Sub Direct. 3.2oz/108gsm, knitted, light weight textile flag with excellent print through and is very transparent. It is engineered with a superior print receptive treatment and is constructed specifically for flag manufacturers to achieve optimal print through. This fabric is compatible with UV, Latex, Dye-Sub Transfer and Disperse Dye-Sub Direct. Avery Dennison MPI 1405 Easy Apply™ RS is a PVC-free, digitally printable film that captivates with superior color pop and conformability to tough textured surfaces, including brick and cinderblock. A matte white flexible vinyl with an ultra removable adhesive. Available in 4 mil or 6 mil. Now available to order from Dreamscape are two of the most popular wallcovering adhesive and wall preparation products from Roman. Dreamscape Luster is a Type II, 20oz commerical, paste-up, vinyl wall covering with a smooth, satin finish. This product offers a smooth surface that has a semi-gloss finish for fine detail and strong colour saturation. Excellent for photographic mural and rendered design applications. Dreamscape Canvas is a Type II, 20oz commerical, paste-up, vinyl wall covering with a canvas finish. The surface is embossed to replicate the look of utilitarian canvas. Flat finish with a slight tooth. Suitable for photographic and detailed designs. Ideal for crisp, sharp edged designs with large colour area. Dreamscape Bling is a Type II, 20oz, commerical grade, silver coloured, textured, paste-up vinyl wall covering. Bling has raised beads that are metallic-enriched so inkjet printing can create new sparkling colours. Applies with standard wallpaper paste. Dreamscape Mystical is a Type II, 20oz commerical, paste-up, vinyl wall covering with a "light cobweb", matte finish that simulates the look of hand painted brush strokes. Dreamscape Plaster is a Type II, 20oz commerical, paste-up, vinyl wall covering with a plaster-embossed matte finish that simulates the look of artwork painted directly onto textured plaster with rough grooves mixed with raised flat spots create a pleasing random dispersion of hot spots. Dreamscape Suede is a Type II, 20oz commerical, paste-up, vinyl wall covering with a very light stipple textured matte finish. This products embossing effect is similar to suede fabric with its nap and texture. Artist Canvas is a 20oz, Type II vinyl wallcovering with a reproduction of painters canvas texture. Crisscross wallcovering is a 20oz, Type II, 2 ply product with a criss cross like texture on the printable surface. Embossing with a heavier stipple (compared Suede), with the look and feel of medium- to heavy-sand paper. Suitable for almost any graphic project. Beads is a 20oz, Type II wallcovering with a surface texture covered in tiny 1mm round raised beads in a random pattern. Silk is a 20oz, Type II vinyl wallcovering with a reproduction of silk texture. Satara Steel is a 20oz, Type II vinyl wallcovering with a reproduction of steel metalic texture. Satara Pearl is a 20oz, Type II vinyl wallcovering with a reproduction of pearl metallic texture. Dreamscape Flash are 20oz, vinyl, paste-up wall coverings in metallic silver, gold, copper, silver odyssey and shiny black finishes. Compatible with UV-cure inks only. Dreamscape Nolar Smooth and Nolar Sail Cloth are 8oz, PVC Free eco-friendly digitally printable, paste-up wallcovering with a white surface. It is made of 100% non-woven fibers and wood pulp, making it a lightweight, economical alternative to PVC wall coverings. Dreamscape Terralon is a 9.3oz, PVC-free, paste-up wall-covering material. Containing 31% post-consumer recycled waste materials. It is available in smooth, textured (slight orange peel look) or heavier textured Regatta. Class "A" Fire Rated in accordance with ASTM-E84 Tunnel Test. Thick 15 mil, self-adhesive wall vinyl, weighing 15oz with a textured finish. Thick 15 mil, self-adhesive wall vinyl, weighing 15oz with a textured added sparkle finish! Dreamscape Caviar Peel & Stick is a 15oz, self adhesive, textured wall covering with a medium stipple texture for a uniform look to reduce glare and provide good image detail. The 13mil thickness hides wall imperfections adding to a professional finished look. WallTac is a matte, printable, PVC film available with either removable, or ReTac ultra-removable adhesive technology for graphics that need to be removed and repositioned. 6 mil printable, matte white polymaric PVC film in a variety of embossed finishes and featuring ReTac ultra removable adhesive. Digiscape II is a robust latex saturated 17mil material that is laminated to a non-woven PET back. This durable construction exceeds the break and tear strength of the Type II commercial wallcovering specifications. FR rated, low VOC. Media for the Summa DC4 and DC4sx. A 1.0 mil, optically clear, permanent/removable, two sided mounting adhesive. A clear polyester film coated with a clear permanent pressure sensitive adhesive on one side and a clear removable adhesive on the other. The printed carrier is made of two clear, plastic release liners. The removable side has green, right-reading text. MultiTac is a white or clear, permanent/permanent, high tack mounting adhesive for difficult substrates. TwinTac is a double-linered, 2 mil, plasticised, clear PVC mounting adheisve coated on both sides with a pressure sensitive, aqueous acrylic adhesive which is protected on both sides by a bleached Kraft grey grid release paper coated on one side with siliconised polyethylene. A 1.5mil PET, optically clear mounting adhesive available in permanent/removable or permanent/permanent. It offers excellent UV stability to graphic prints. OptiTac CF is a 1.75 mil, unsupported pressure sensitive, permanent solvent acrylic adhesive, protected by a clear PET release liner on both sides. Optimount adhesive is an economically-priced double-sided, pressure-sensitive, water-based adhesive with a clear carrier that creates a permanent bond to both graphics and substrates. Ideal for face mounting inkjet, photographic or paper media to clear acrylics, plastics and glass. It does not provide any UV inhibitors but is ideal for use in backlit displays and vented light box applications. Optically clear, double-sided mounting adhesive. UV-resistant. Ideal for back-lit displays.